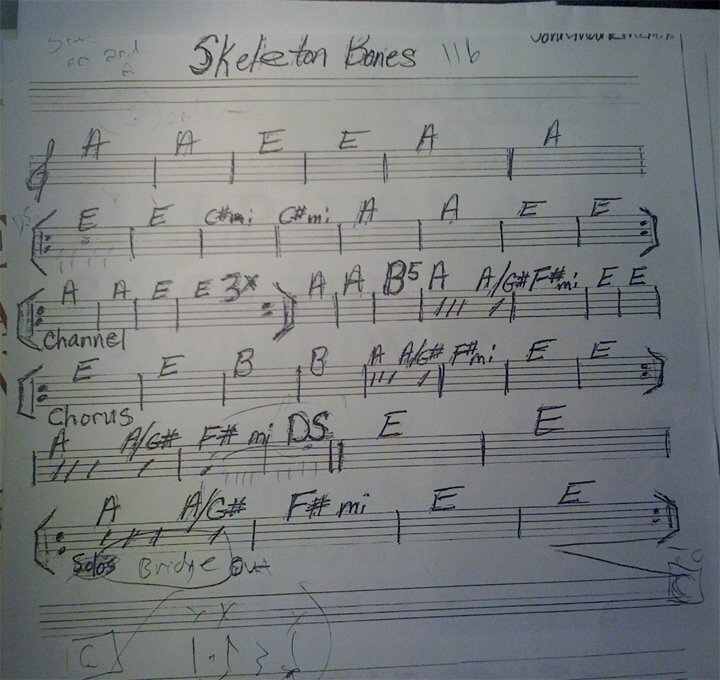 Skeleton Bones is a frequently requested song from my new album The Medicine. So finally I got around to posting a chart (or something like it). I will have a more legit looking chart in the near future. 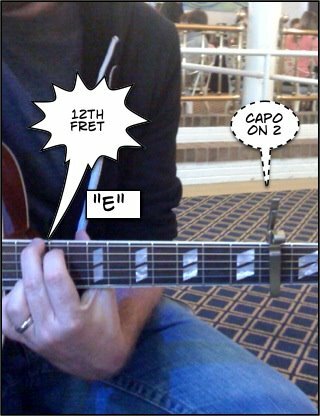 I use a capo on the second fret and I play mostly “G” and “C” shaped chords on the 12th fret to make the song in “E”. 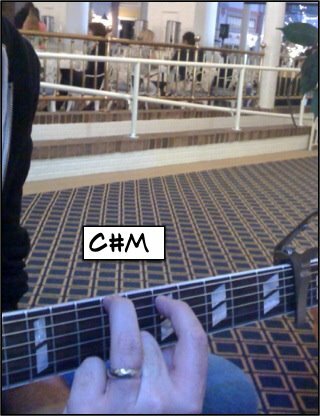 The rhythm comes form the way I hammer on my index finger on the top chords from an open string. This gives it the twang. The C#m can be a little tricky for this technique but if I can do it anyone can. 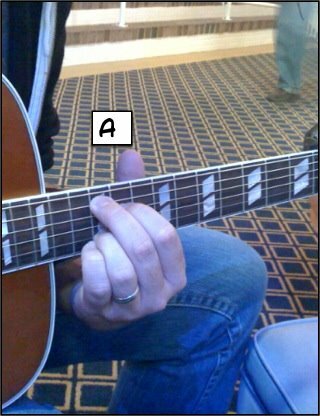 I’ve also posted a couple of examples of chords so you can see the voicing. I don’t put the voicing on the chart because I usually don’t want the whole band playing the extra notes my guitar makes or it comes across a little Jazzy sounding. So I just didn’t the voicing in. 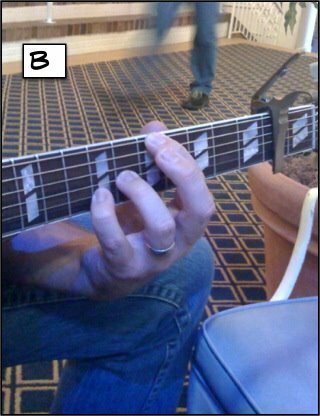 However if you play “G” and “C” shaped chord on the 12th fret but leave the other strings open you will attain the desired effect. 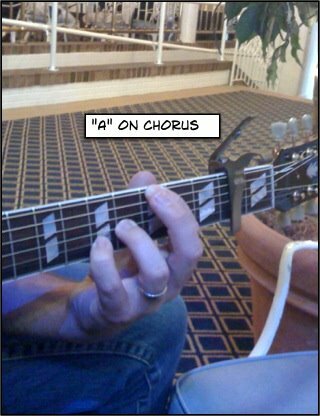 For the other chords like the “A” and “B” on the chorus I have posted some diagrams for you to see how I play them as they are not common but not difficult to play. Also since I’ve noticed people singing and posting the wrong words. I’ve included the real lyrics to the song for your pleasure. Flowers actually wrote lyrics for this project. Infact every song is good. Once you get past the ridiculous intros at the beginning of half these songs you start to discover that the melodies are righteous and the content is intelligent and heartfelt. Eh…everyone is recording this album now but Beck did it in 2002. Every single song is good. I can listen to it all the way through any day of the week. Not to mention that Pete was one of the first to incorporate both a folk vibe and electronics into his music at the same time. Sure, Wilco did it, but Pete actually got played on the radio. Sorry haters, but John Mayer will be famous long after your indie rock heroes and hipster kings have gone back to managing Carl’s Jr. This is because of 2 reasons: 1. He writes huge pop songs and 2. He can spank even most of his own influences on the guitar. John could stop catching hits altogether and still fill arenas with sweaty guitar geeks. Sorry hipsters but skill and discipline will almost always outlive vibe by a century of dog years. Springsteen releases the only actual folk (as opposed to folk influenced) album of the last couple of years and people give him heck for it. I actually read a review in a popular magazine that called it lame and said it was an album of Pete Seeger covers. First o all, I think that if you’re going to call something “lame” then you should at least know what it is. It’s an album of hundred-year old folk songs that people like Seeger kept alive. The idea is that every generation takes the songs and adds a bit of themselves to it. So each song isn’t written by an individual, it’s written by generations. Prediction: These songs will be known long after that particular magazine has ceased to print words onto paper. Evil Urges is only getting any recognition because Z was so good and the media missed the chance to praise it. There’s like an unwritten law somewhere that says you can’t promote and album once the band has released another. So the world is trying desperately to love on Z through Evil Urges. When people say anything good about Evil Urges I’m just going to go ahead and transfer it over to Z in my head because Z deserves it. Irish hipsters singing beach songs with folk instrumentation. It doesn’t get a whole lot better to me. I’m still a little confused at why this band didn’t do better in the states. Maybe they did and I just didn’t get it in North Carolina. Why do people never mention this album? After all, I’m pretty sure it had the two biggest radio hits of his career: “New York New York” and “When the Stars Go Blue”. Not to mention “Sylvia Plath” which is one of the best songs he ever wrote, in my humble opinion. 90’s grunge hero records an album of folk songs in his basement. At least this is what it sounds like. This soundtrack sounds so beautifully low budget but at the same time is stacked with energy. The character of Eddie’s vocals alone is worth the $15 I spent on this disc. I’m not going to lie, I love sad songs. This album is full of those, but on top of that its one of my favorite writers (Kevin Prosch), with one of my favorite drummers (Martin Neil)and produced by one of my favorite producers (Ethan Johns). So it just makes sense that this would be one of my favorite albums. I lost the CD years ago when my car got jacked and at the time the album was almost impossible to find. Then recently a friend of mine gave me an old copy he found in his attic. Roomer has it that Kevin and Martin could be serving up another pot of Pepper Corn gumbo this year and I will be first in line with my gravy bowl.